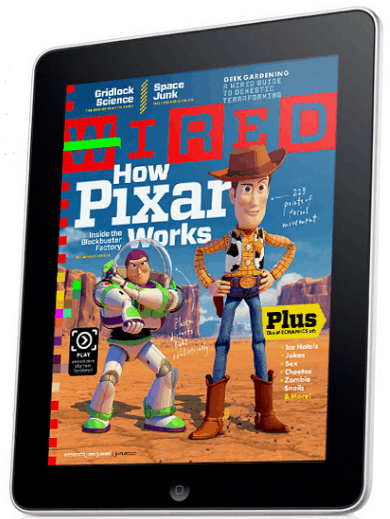 Several months ago Wired Magazine gave away the May 2011 issue (it's still available). I reviewed the app at that time, and I dissected and discussed its strengths and weaknesses. Unfortunately, my review was limited by the fact that I had just the one issue. There were a number of details that weren't obvious until I got the chance to look at several issues at once. Now that I have a print subscription to the magazine, I have the opportunity to download all related issues. I think I now have a better grasp of how each issue is put together, how content is chosen, and other details like that. I think the iPad edition of Wired Magazine is an example of checklist publishing. Note that I'm not saying checkbook, I'm saying checklist. The app appears to have active content added not because the content is worthwhile but simply because having active content is on the checklist. I also now have an iPad subscription to the National Geographic Magazine, and it's helped me put into perspective my feelings about the Wired app. I discovered that I like playing with the enhanced content just because it's enhanced content. The Wired content just isn't as interesting as that of the NG Magazine app. Wired always have more but most of the enhancements seem like they don't actually enhance the value of the app. There's an animated GIF in the May issue that illustrates this point. It shows a kid's eye being propped open by a light saber (in place of a toothpick). It's an interesting image, but a static gif would have worked just as well (and cost less to produce). And then there are the videos they seem to have every month that star one or more Wired staffers. In the May issue there was a video that showed you how to play lawn darts. Um, I can find a video like that anywhere. It's not original so why bother including it? Take the cover, for example. I have 5 issues of Wired now, and every month had a video on the cover. It's usually not very interesting, and at least a couple months the videos feel like they are filler (May, June). Yes, I do find it mind-boggling that they put filler video on the cover. That's part of why I think they are using a checklist. In fact, there's so much unappealing enhanced content in the Wired app that I suspect that the checklist actually has a line item for it. I bet that a minimum X number of enhancements must be included ( or X%) before the app can go out. Let me give you an alternative, based on what I've seen in the NG Magazine app. That app feels like they expanded upon the central theme of each article to find something more they could do with it. For example, an article on artificial reefs included a clip showing a ship being sunk so it can become a reef. Then there are the maps where you can use the legend to remove one detail at a time. I also like how the NG Magazine app handled the cover. Sometimes they're enhanced, but often times they're not. This month's cover included a humanoid robot that you could rotate through 360 degrees. So what do you think? I know I spend too much time looking at stuff like this that I tend to miss the forest for the trees. Am I right or wrong about the quality of the content and how it's chosen? P.S. And I didn't even touch on the formatting decisions in the Wired app. I'm pretty sure that the checklist also requires that each neat looking layout design trick be used at least once per issue, no matter if it improves the content or not. Ive only had my iPad for a couple of weeks, but I’m loving it for reading. I’ve bought a few kindle books, and also subs to both Wired and NatGeo. Much as I like Wired, I’m inclined to agree with you up to a point. Some of the “enhancements” can seem a bit arbitrary and gratuitous, but to be fair these guys are feeling their way in what is virgin territory. Wired was first of the blocks with a genuinely digital magazine – as appose to just a PDF type rendering of a printed edition, and as a designer myself, I think they deserve some credit for creating something that is (mostly) both functional and aesthetically pleasing. Also, Wired is a primarily a celebration of, and showcase for technology so a bit of geeky showing-off is acceptable in my book. I concur with your comments on Nat Geo completely. They have done a great job, and the always astounding NG photography looks just stunning on the iPad screen. Only just found your blog, but enjoying it very much. Linds. Waiheke Island, New Zealand. They’ve been publishing an iPad edition for a year now. I would think that is enough time to at least trim the gratuitous content.